University of California, San Diego faculty members Georgia Robins Sadler and Michael Sailor will be honored this week for their outstanding services as mentors to UCSD undergraduates. 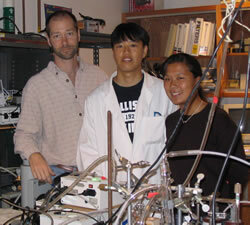 Sadler, clinical professor in the Department of Surgery, and Sailor, professor of Chemistry and Biochemistry, both serve as mentors through UCSD’s Faculty Mentor Program, one of various undergraduate enhancement initiatives offered by the Academic Enrichment Programs unit under Student Affairs. The two professors will be recognized at the 2004 Faculty Mentor Program Research Symposium to be held June 1 and June 3 from 6 p.m. to 9 p.m. at the Price Center. Sadler will receive her award for her contributions to mentoring in the areas of Social Sciences and Humanities, while Sailor will receive his for mentoring excellence in Science and Engineering. In addition to honoring outstanding mentors, the purpose of the symposium is to allow students in the Faculty Mentor Program to present before peers and faculty the scholarly research they have produced over the past two quarters as participants in the program, and to encourage more undergraduates to pursue doctoral degrees and careers in research and college teaching. “The Faculty Mentor Program has been extremely fortunate over the years to have attracted a wide range of dedicated and talented faculty who give of their valuable time to nurture undergraduates in research and graduate school preparation,” says David Artis, Ph.D., director of Academic Enrichment Programs. “And it is especially a privilege to honor two mentors such as Drs. Sadler and Sailor who have been nominated by their mentored students for exhibiting exemplary mentoring qualities,” he says. Sadler, since becoming a mentor in the program in 1993, has often taken up to five students at a time under her wing for individualized research experiences in her breast cancer screening studies and other research efforts. Sailor, who specializes in material science, has been a mentor since 1992 and is often cited by students for his “personalized dedication to students’ professional growth, his compassion for the learning process, and for challenging students to ‘think outside the box,’” says Darlene Salmon, coordinator of the Faculty Mentor Program. Like other undergraduates in the program, students mentored by Sadler and Sailor often go on to graduate school after graduation. Crystal York, Warren College, Biology Major: Recruiting African American Women via Health Parties. Tami Chau Chheng, Muir College, Biology Major: Then and Now: Asian American Breast Cancer Screning Rates. Stephanie Wong, Marshall College, Biology Major: Breast Cancer Screening Rates Among Asian American Women. Tiffany Sims, Marshall College, Human Development Major: Norming the Panas for the African American Community. Erin Gonzales, Revelle College, Biology Major: Mining Your Data: What to Do When Your Primary Hypothesis Does Not Yield Significant Results. Paul Lee Reeves, Warren College, Political Science Major: Effecting Social Change Via the Media. Eric Ricote Briones, Roosevelt College, Biology Major: Media Enhanced Scientific Studies. Wennie Huang, Revelle College, Biology Major: Breast Cancer Screening Rates Among Asian American Women. Peter Kim, Warren College, Biology Major: Controlled Drug Delivery with Porous Silicon. Valerie Ng, Revelle College, Biology Major: Properties of Porous Silicon as a Device for Improved Delivery of Medicinal Drugs. For a complete listing of all 137 undergraduates presenting at the Faculty Mentor Program Research Symposium, their mentors, and research presentation titles, please contact Darlene Salmon, or (858) 534-5791.